Dickinson Center, Inc. Receives Rural Health Program of the Year Award — Dickinson Center, Inc.
"Congratulations to DCI's Total Health Program!" (University Park, Pa.) The Total HEALTH Program at the Dickinson Center, Inc. received the 2014 Rural Health Program of the Year Award from the Pennsylvania Office of Rural Health (PORH) at a Nov. 20 awards presentation at the Dickinson Center, Inc. in Ridgway, Pennsylvania. 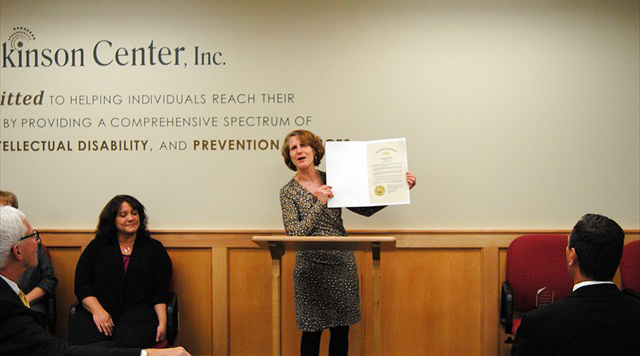 The award was presented during Rural Health Week in Pennsylvania, Nov. 17-21. The week encompasses Nov. 20, which is National Rural Health Day, established in 2011 by the National Organization of State Offices of Rural Health. The Rural Health Program of the Year Award recognizes an exemplary health program that addresses an identified need in a rural community; uses unique, creative and innovative approaches; ensures access to the community it serves; includes statewide resources as part of the planning and evaluation process; and demonstrates a significant benefit to the target population. Lisa Davis, director of the Pennsylvania Office of Rural Health (PORH) and outreach associate professor of health policy and administration, presented the award to Jack Goga, chief executive officer of the Dickinson Center, Inc. The nomination, submitted by Curt Proctor from the Behavioral Health Alliance of Rural Pennsylvania, recognized the Total HEALTH Program in its efforts to offer holistic treatment options to the residents of Elk, Cameron, and McKean counties to improve care coordination and better meet the health care needs of those communities. The program is a collaboration between Penn Highlands-Elk, Dickinson Center, Inc., and an independent physician in Elk County, to provide primary and behavioral health care services to individuals with physical and psychological conditions. The organizations meet weekly to assess patient progress, ensuring they are up-to-date on all aspects of care so they can help patients achieve their goals and healthy outcomes.